I’ve got quite a backlog of posts I want to publish, but I’ll squeeze this one in first. I want to think about how I can make the most of this new old (2011!) index card habit, and whether I should reconsider that voluntary bottleneck of publishing one post a day. For the past two weeks, I’ve drawn at least five index cards each day. (You can find them on Flickr.) Each card explores a single thought. I like the way this lets me briefly capture what I’m curious about. I’ve included many of them in blog posts, grouping several thoughts into a larger chunk that’s easier to link to. Still, at the present rate, my monthly review for January will link to well over 150 sketches. Perhaps I’ll change the monthly review section to list only the sketches that haven’t made it into blog posts yet. I’ve been keeping a digital equivalent of the roughly-sorted piles of index cards on my desk. 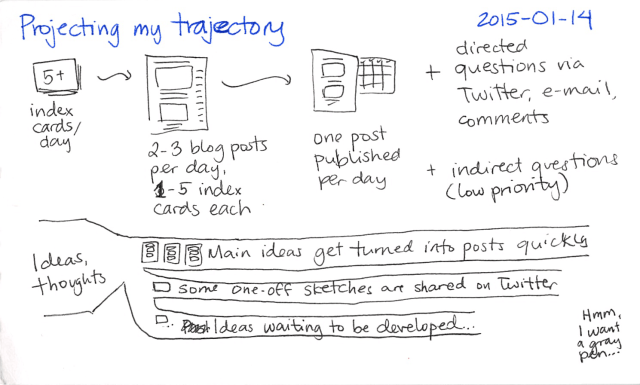 It helps me see growing clusters of ideas and choose ones I want to develop with additional sketches or summarize into blog posts. Also, at the present rate of writing 1-3 blog posts a day (except for Thursdays, when I focus on consulting, and the weekends, when I focus on household life), I will keep accumulating scheduled posts. At some point, this will become unwieldy. It doesn’t make sense to schedule posts a year in advance. Even a backlog of three months seems too disconnected. I can spend less time writing, but I’ve firmly wired it into the way I learn, so that’s hard. Alternatively, I could spend more time writing, developing thoughts over more time and packing denser experiences into a post. This approach might work. I can also get ideas out in other ways. My blog is the main archive I trust, but I can give myself permission to share one-off sketches on Twitter. For example, this sketch about keeping your drink safe from cats: it’s not quite a blog post and I don’t think I’ll develop the thought further, but it might be okay to share it on its own. 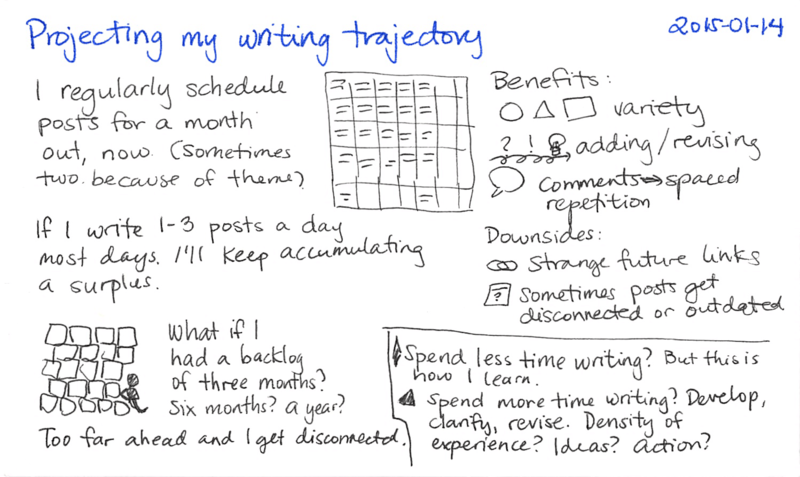 So, if I write blog posts for the thoughts that are already developed and tweets for the one-offs that won’t be developed further, that leaves the ideas that are waiting to be developed. They wait because I’m still figuring things out, or because they aren’t quite connected to other thoughts, or because my attention has moved on to other things. In Toyota Production System terms, they are muda – waste because of waiting or possible over-production. I want to do better. What are some ways I can improve at this? One way to reduce waste is to reduce quantity. 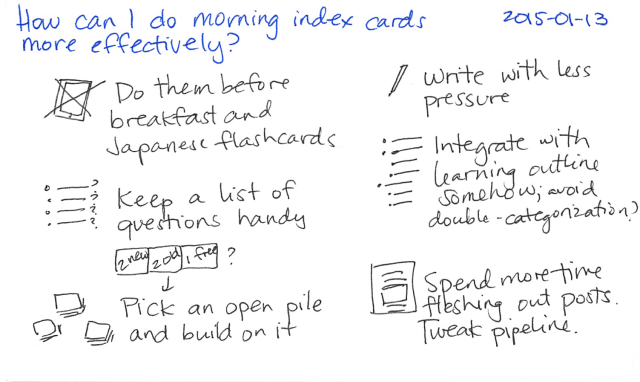 Is five a good number for index cards, or should I reduce it to three? I think five works well for me. It forces me to dig deeper into a topic or to capture some of the other thoughts I have floating around. Another way to reduce the waste in this process is to be more focused. If I think about and articulate 2-3 key questions for the week, that might guide most of my index cards. But then interesting ideas come up during the week, and I draw lots of cards for those as well. 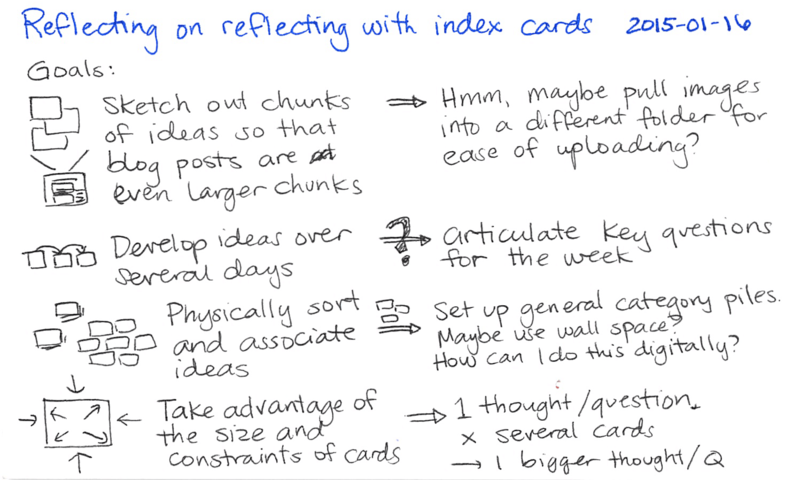 I turn many of my index cards into blog posts on the same day, so within each day, there’s focus. 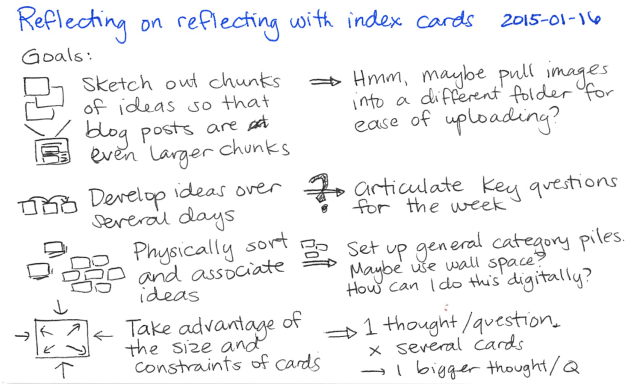 If I try to use any “extra” index cards to build on a previously-drawn thought, that helps me connect. A third way is to reduce my attachment and let things go. Perhaps I might decide that after I make a monthly index of unblogged cards, I’ll clear that index and archive the physical cards. That way, each month starts fresh, but I still have the ability to go back and look for those roughly-categorized cards in case I have an idea that’s strongly connected to that. I don’t have to worry about visualizing this archive, tracking my statistics, using all the dangling threads, or getting to 100% use. One option is to go back to publishing two posts during the weekend: a weekly review, and maybe another thinking-out-loud/reflection post, since that’s the one that has the most surplus. Another option is to post two times a day. I’m a little less keen on that, although it might be doable if I can keep my main archive but split off specific, lower-traffic, topic-focused views that people can subscribe to. A third option is to write longer posts. I find my constraints on chunk size to be helpful, so maybe not. Hmm. Maybe I’ll publish two posts during weekends, and then revisit this when I find myself scheduling three months out… =) Suggestions?